The big bonus of presenting programmes on internet radio is I get to play the music I want to play, not the music that a focus group tells me to play. On Monday afternoon we have a fun programme for New Year's Eve, and as part of it I'm playing a 15 minute sequence from a double CD that's a personal favourite, but that doesn't fit into any conventional programme format. Jazz pianist Uri Caine's treatment of Bach's Goldberg Variations defies any categorisation and I'll be playing tracks varying from solo piano to full on jazz. It's all part of our Happy New Ear's programme which is on Future Radio from 1.00 to 4.00pm on Monday December 31st, the Goldberg sequence should be on air at around 2.00pm. 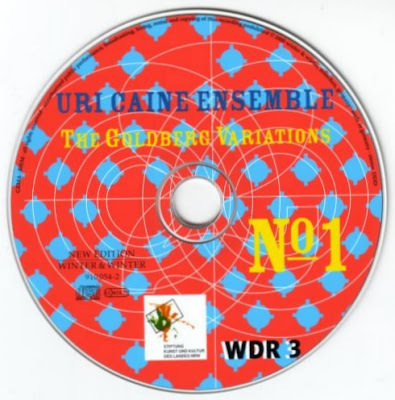 Uri Caine's take is just one of several variations on the Goldberg Variations in my CD collection. Least successful is Robin Holloway's 'recomposition' for two pianos titled Gilded Goldbergs on Hyperion, a double CD which takes a long time to add very little, while Jacques Loussier's jazz variations take less time to say little more. Among my favourite variations on variations are two recordings of Dimitri Sitkovetsky's masterly transcription for strings. One is a limited edition CD recorded in the beautiful Romanesque cathedral in Vaison la Romaine by the Trio de Prague in 2002, while the other is the fine 1993 recording by the NES Chamber Orchestra on Nonesuch which is noteworthy for both its committed performance and the sleeve notes by John Adams. But Uri Caine is up there with the best, listen in at 2.00pm UK time on Monday December 30th if you can. Read more about Dmitry Sitkovetsky and those John Adams sleeve notes here. Like you, I very much like the Sitkovetsky arrangement for string orchestra. It is very imaginative, and very successful, I think. I have never had the chance to hear the arrangement performed live. My only exposure is via the Nonesuch recording. In fact, we listened to the Nonesuch recording one weekend earlier this month while making Christmas preparations. It would seem to me to be perfect for the Saint Paul Chamber Orchestra, but SPCO has never programmed it, to the best of my knowledge and recollection. I would be happy to be corrected on that point. I shall have to seek out Sitkovetsky's trio arrangement. Happy New Year to you, Pliable. Drew, your kind thoughts are appreciated. Music trivia. Your mention of the Nonesuch recording reminded me that I bought my copy on a cold December day in Helsinki some years back - the same day that I visited Sibelius' house outside the city at Järvenpää. Thanks for bringing back that memory, and best wishes for the New Year. Reminds me of a concert I saw by Gilbert Kalish. About a year back he visited our university and played Thirteen Way of Looking at the Goldberg. Along with the Bach's Aria and 13th variation, it's a collection of contemporary composers' interpretations of the Goldberg Variations. There were some notable names among the interpreters, like David Del Tredici, William Bolcom, Lukas Foss, and Jennifer Higdon. But it really the work of the less familiar composers that impressed me most--like Derek Bermel's funky Kontraphunktus and Frank Lerdahl's Chasing Goldberg. All in all, it was a hit or miss affair.